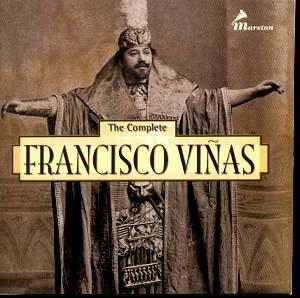 Francisco Viñas was born a Catalan near Barcelona in 1863 but he’s probably better known from the name on his Italian-made recordings; Vignas. His Barcelona debut was in 1888 in Lohengrin, a performance given very soon after his student years had concluded, and his career advanced with distinction until his final appearance in 1918. He died in his home city in 1933. Inevitably he sang in a wide variety of roles - Lohengrin, Cavelleria rusticana and Carmen in La Scala, and all over Italy, especially in San Carlo in Naples which was a favourite house of his. He sang frequently in Madrid and in Lisbon. By 1891 he was giving the London premiere of Cavelleria rusticana and success at Covent Garden was soon followed by an invitation to the Met in New York though he was not frequently heard there – illness, dislike of sea voyages and the sheer weight of numbers of fellow singers all playing their part. He sang alongside Albani, Calvé, Nordica, Plançon and Melba. Viñas’s training in the old Italian School makes itself apparent at every turn. His breath control, mastery of passaggio, and powerful open tone attest to his particular excellence. His diction is clear, vowels open, and dynamic nuances eloquently presented. It’s bel canto singing of a rarefied kind with legato and portamento prominent components of his expressive arsenal. Probably his greatest claim on historical memory is as a pioneering Wagnerian. Lohengrin was his most famous role, one he sang repeatedly and one fortunately that he recorded. There’s a mellifluous Italianate ring to his 1903 Milan G & T of In fernem Land which sweeps to the end on a lovingly lascivious portamento. Similarly the second part of Mein lieber Schwan! (which was all that would fit) – this, like the other examples, sung in Italian of course – is sung with affectionate delicacy, the tonal quality of the voice capable of the subtlest inflexions running from a gentle floating of the tone to more hardened steel but with never a bark or incipient crudity of projection. The voice was very much as free and flexible in the long series of Fonotipias made between 1905 and 1913. Atmest du nicht mit mir was another example of his Lohengrin, in which he sings with an appealing grace and elegance with fine production but not forcing of the voice. New to his discography at this point was the first half of Mein lieber Schwan! dispatched with expressive diminuendi, fulsome portamenti and a compelling lyricism. There are altogether far too many points of interest in this set to itemise them all – and that includes the three sides from Tannhäuser – but it would be remiss indeed to ignore the four 1912 sides of music from Parsifal, which wasn’t to come into the public domain until December 1913. Of course Viñas made these persuasive recordings before he sang the role on stage and they include an interpolated high A flat in the final side. And one should also mention the numerous Italian and Spanish songs by such as Gaztambide, Álvarez, Guetary, Cotò, Chapí and others. They all possess an ineffable charm and assurance, and remain an important part of his discography. Marston can always be relied upon to provide superb documentation with excellently produced photographic reproductions. The transfers are very forward, in house style, and the voice is therefore at the centre of the soundscape, to its benefit. Finally I ought to add an addendum. Marston has announced since the publication of this set that two missing Viñas sides have now been located and will be issued by them in a Spanish Tenors set. And he has also drawn attention to some pitching concerns, the main one of which relates to CD 1 track 4 – an aria from Die Walküre. He suggests variable speed play for those who have it to see whether it’s sung at score pitch or has been transposed. For what it’s worth I tend to agree with Marston on the latter theory.